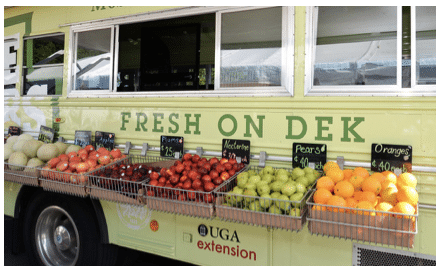 University of Georgia’s Cooperative Extension will launch the fourth season of Fresh on DeK, DeKalb County’s Mobile Farmers Market on Saturday, May 19, from 10 a.m. to 2 p.m., at the DeKalb County Extension Office, 4380 Memorial Drive, Decatur. Event attendees will be able to purchase fresh produce at a reduced cost and participate in educational demonstrations from the Extension. There will also be interactive games for children along with food and prizes. Fresh on DeK’s purpose is to improve the health of the community, the viability of local produce and to preserve the environment for future generations by providing access to fresh produce and nutritional education programming throughout DeKalb County. For more information about Fresh on DeK or to learn more about other programs and services contact the DeKalb County Cooperative Extension office at 404-298-4080 or visit www.extension.uga.edu/county-offices/dekalb.html.